I thought of his comments as we cut wood yesterday. Cutting wood requires me to be completely in the present. Disaster could be the result of distraction. Three hours of paying close attention to my movements, my body, trees with their limbs, uneven ground, Fred’s position and sounds around me becomes three hours of meditation. Riding in the truck, with a full load of cut wood is my happy time. Part of it is a job done with the knowledge that we’ll have a few more warm-house weeks this winter. But after listening to Harari, I think perhaps some of that happiness is due to living in the present for those three hours. 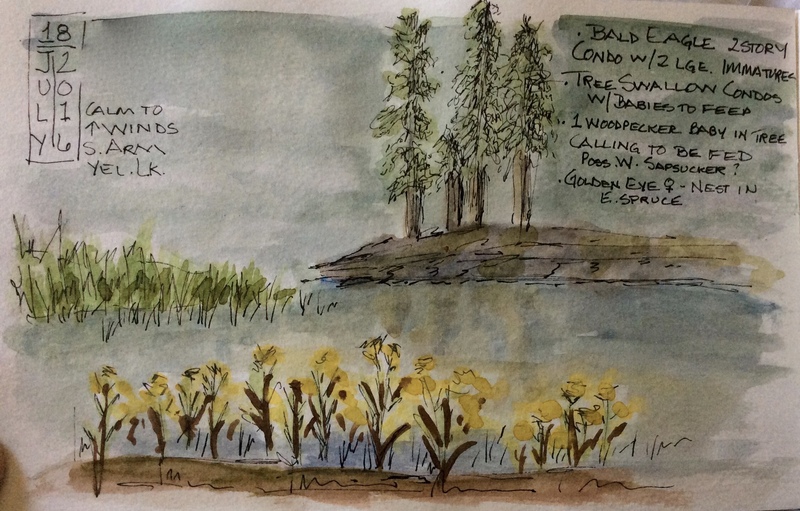 Last week, Diane, Jane and I returned from our most recent outdoor adventure. 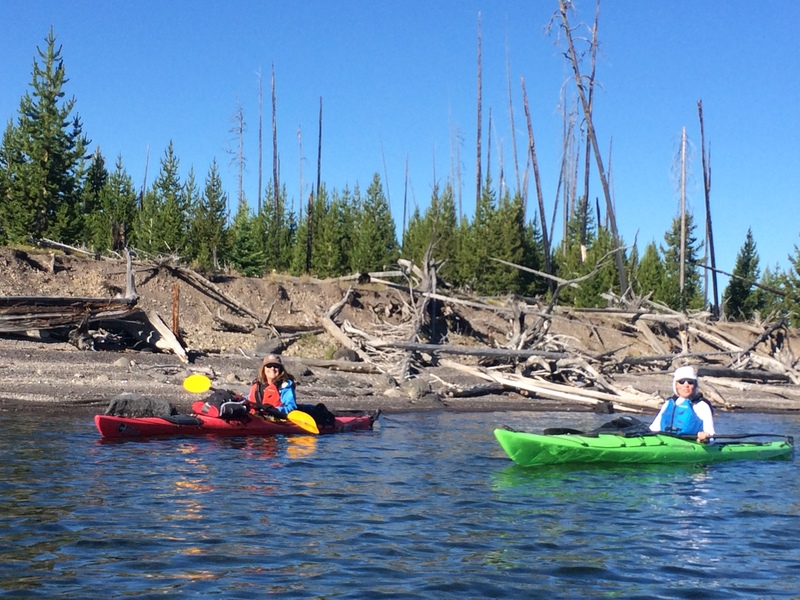 We spent ten days on Yellowstone Lake for our third annual kayak trip. The very act of kayaking on a cold high mountain lake requires one to pay close attention. I watch the clouds, feel the freshening of the breeze, feel and watch the waves as I evaluate our safety. Are the waves building? Is the wind strengthening? Should we cut this bay or stick close to the shore? When we round that point ahead and lose its protection, how shall we handle the waves? Paddling becomes a meditation of awareness. This year we had perfect weather. We snuck between some high wind hours, arriving early to our campsite and leaving early each morning. After an hour or two of paddling, we would stop for breakfast along the shore. A few times the wind picked up before we stopped but calmed while we breakfasted—an uncommon occurrence! Calm mornings allowed us all to move slowly along the shoreline. We would paddle a few strokes then stop and sit and look, in mostly silence. 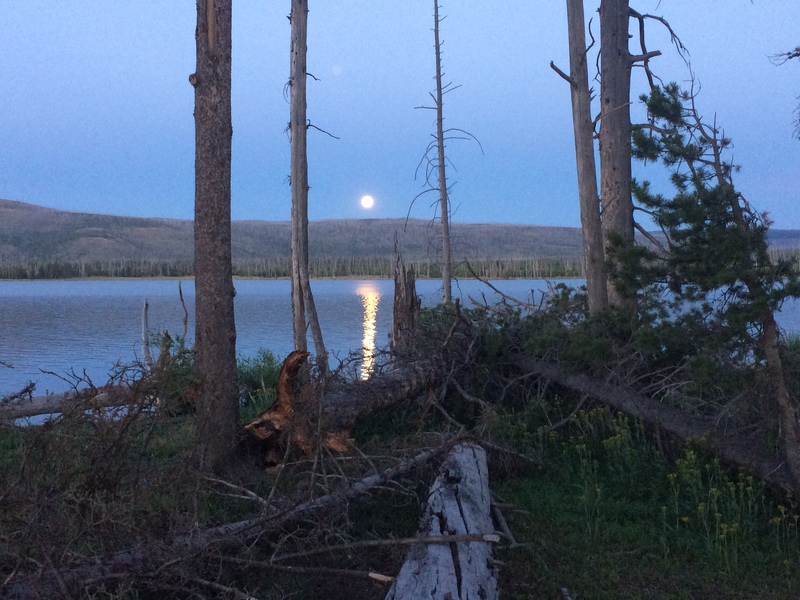 This year, more than any other, I experienced Yellowstone Lake’s Arms—the Flat Mountain, the South and the Southeast. Other years I’ve paddled them. This year, I breathed them in as I looked. And looked. I inhaled lake smells, fresh air smells, and smoke smells from far-away fires. 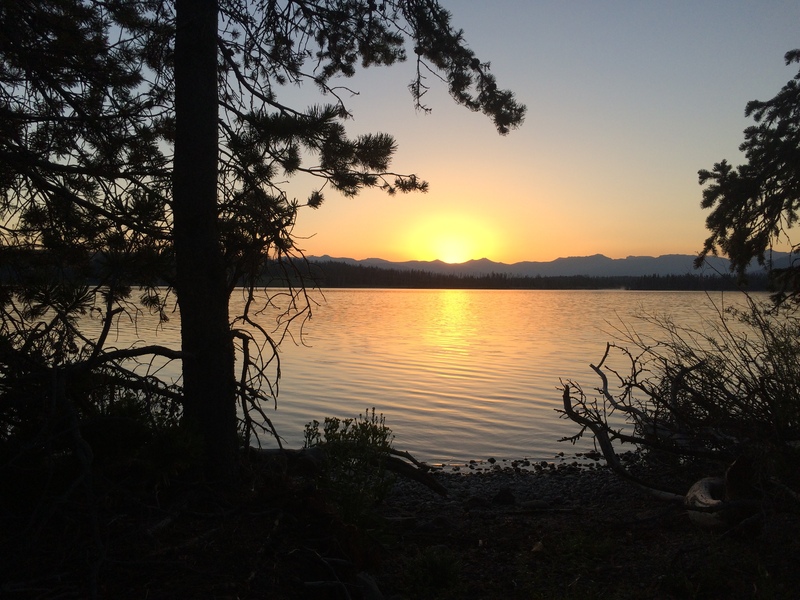 At night, lying in my tent, my body still floated on the water. I saw flowers: magenta Fireweed, creamy Buckwheat, white Pearly Everlasting, deep blue Fringed Gentian. Burned trees, deer along the shore, rocks just under the surface. In the distance rose the Red Mountains, the Trident, Doane and Stevenson Peaks. We climbed the Promontory for 360 degree views of this remote corner of the Lower 48. 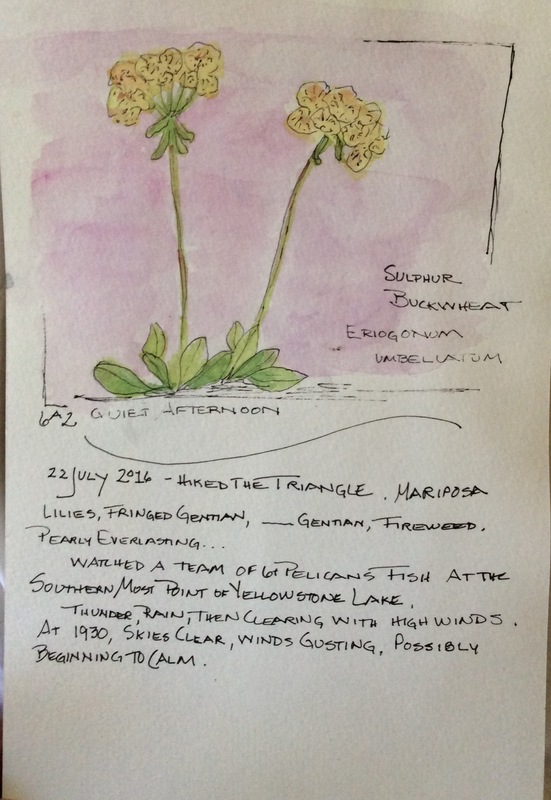 We hiked ‘the Triangle’ from the Southeast Arm to the South Arm and back exclaiming over the Fringed Gentian, Mariposa Lilies, Monks Hood, and Paintbrush. We stopped with our binoculars at the South Arm to watch American Pelicans fish in unison—tails up, wings partially open, heads down, then heads up, herding fish. 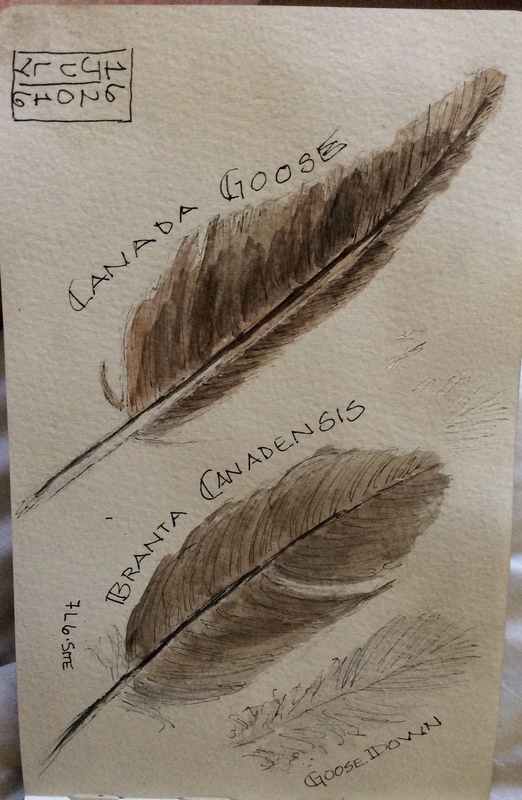 Canada Geese hung around plucking up scraps of floating vegetation. This year on the Lake, we slowed time. No hurry, no intensity. But lots and lots of appreciation and gratefulness. Daily we thanked the Lake, the skies, the beauty and each other. On our final day we paddled the south curve of the Southeast Arm. 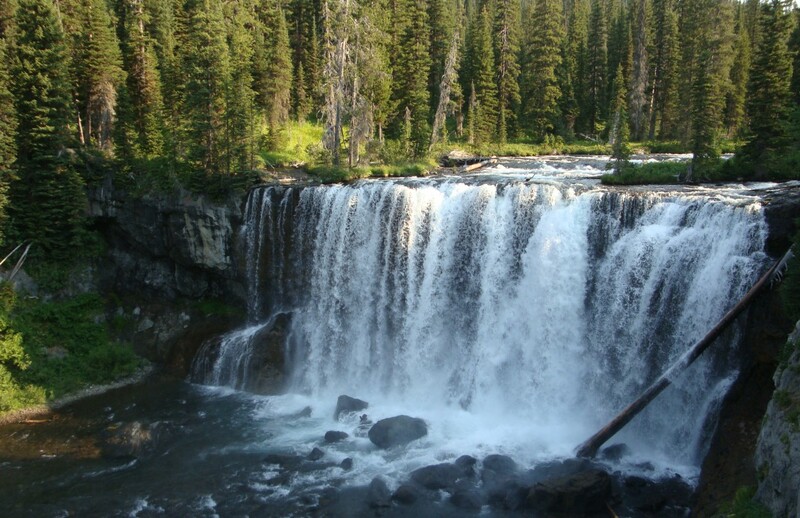 We had thought to explore the Delta where the Yellowstone River widens into Yellowstone Lake as it washes from its headwaters on Younts Peak. The shallowness of the water caused us to change our plans and we headed into camp, had lunch, then hiked Langford Cairn. We climbed in the heat, swatting flies, stepping over logs and weaving our way through sagebrush. We made it to the top where a breeze kept bugs at bay. We sat and looked. And looked some more. 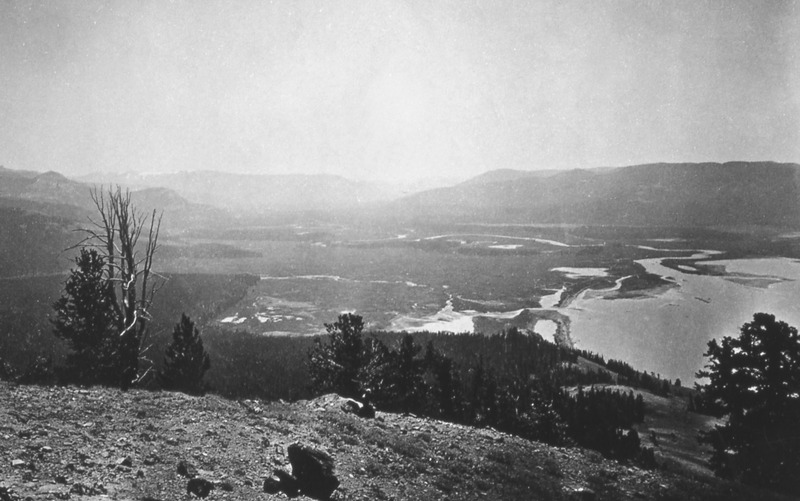 In 1871, William Henry Jackson stood on Langford Cairn and took a photo of the Delta and Thorofare. We took a photo from his vantage point, and I felt part of history. 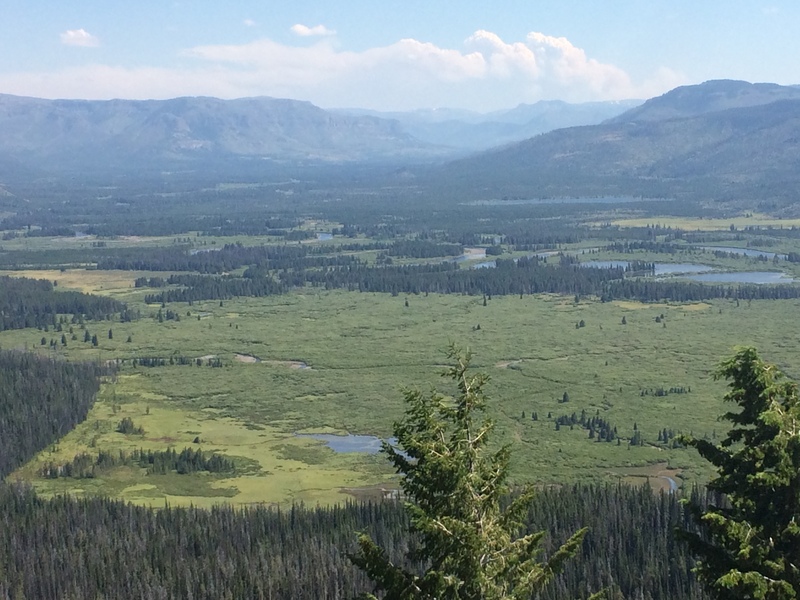 We looked for and found Eagle Peak, the highest peak in Yellowstone National Park. All of us have had experience with Eagle Peak and we shared our stories. Other peaks in the Absaroka Range were identified and we looked far south through the Thorofare toward our next adventure which will take place in August when we horsepack into Younts Peak. Living in the present is one of many things that attracts me to the back country. Particularly with kayaking, when inattention could cause catastrophe, I must stay present. A phone becomes an irritant, superfluous. I am impatient if there is cell service. Though I feel I should check in with loved ones, I don’t want to take my thoughts away from the here and now. Living in our modern civilization, we can indeed afford to be distracted and yet survive, even becoming successful as a society. But wildness. The backcountry. Living in the now of nature is what makes me happy. Writing the Wild Turns One! Living in the present is almost foreign concept to me. This is a great reminder! Thanks, Debra! I wonder if biking does the same for you? Awesome Julianne. I wish I could have been with you. Thank you, Marcia. It was very special. You would have loved it. Being here at the lighthouse was a much slower pace-hard to get used to but important to do once in awhile. Lovely prose and pictures! Thanks, Teresa! It is good to slow down once in a while, eh? Always a welcome to read your beautifully written nature adventures. I’ve continue to enjoy life on a much slower pace than those around me! Fred might remember one time at the cabin near Brevard! Looking forward to more of your reflections, Julianne. Starting a meditation practice several years ago helped me to live in the present moment. Being out in nature now seems to bind me in the present moment. I really loved this post Julianne. I felt like I was on this journey with you. Thanks, LuAnn. You would have loved it, I’m sure. I’ve tried sitting meditation and Tai Chi. I find l liked the moving meditation the best, but no Tai Chi here. I think the reason I ran in years past was for the meditation, and now the hiking and just being ‘out in it’ brings me home to me. Your posts reflect you being in the present moment. Sitting meditation still is a work in process for me. I defer to the outdoors whenever I can and when we are back in So Cal, not traveling, sitting meditation is my go to for centering myself. I feel like I am there again reading this. Thanks for your words that convey true feelings of wonder and wildness. Fun trip. Thank you … and Jane.. for sharing the experience and the appreciation. Thanks, Diane. Glad you got to ‘re-experience’ the trip. It was most special. Thanks to you for your organization! and for being the perfect companion! Thank you for this wonderful reminder how important it is to live in the present. 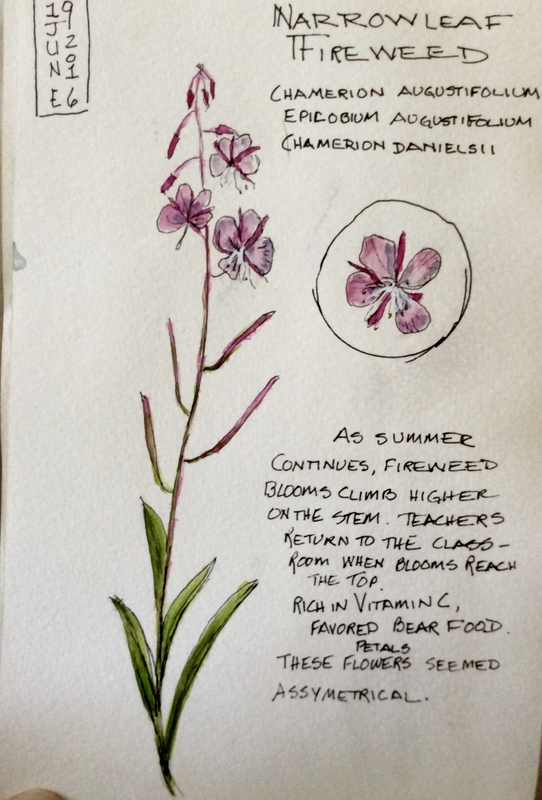 Important reminder, lovely poetry in your expression…and I really like your watercolor of the Narrowleaf Fireweed. Wonderful post, I live more in the present now and can enjoy more the brilliance or simplicity of nature albeit slowing down due to health reasons. And on the off days, well I hope I can embark on an adventure and find comfort and relaxation just by reading these posts! Thank you, Ingrid. I hope you are able to continue to be able to enjoy nature in the present.